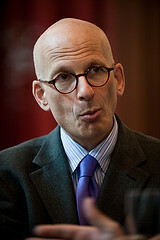 Your publisher career just got easier, thanks to Seth Godin. Godin, New York Times bestselling author 12 times over (Purple Cow, Tribes, All Marketers Are Liars) dropped a bomb on the traditional publishing industry a few days ago when he announced on his blog that his just released book Linchpin is the last he will publish old school style. You should pay attention because this is a Big Deal. Godin’s reasoning is that authors only needed a publisher in the past because they needed a customer. The traditional publishing model kept the author separated separated from his readers by many levels â€“ stores, distributors, media outlets, printers publishers â€“ but with the internet there is no longer any separation. An author can (and should) build his own fan base through a blog, social media interaction, etc. No publisher needed for that. The publishing industry has truly become the square wheel, with nothing of value to offer a person like Godin. Having worked in the biz awhile himself, he bears no ill will against publishing but has certainly evolved beyond the need for it. If you want a publisher career based around your books, the time has come to focus on building your tribe of eager readers who consume everything you write. Like Godin says, no publisher needed for that. You can do it all on your own. We may not have quite reached the tipping point beyond which printed books are a rarity but it’s coming. Kindle sales are way up. Future writers may choose to eschew paper altogether and publish only digitally. For now though, sit up and take notice â€“ a Big Name Writer has chosen to diverge from the old way of doing things. The stigma of a self publisher career just took a big hit. 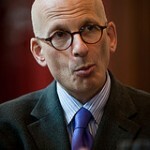 If Seth Godin does it successfully, why not you? SOW 24: How Entrepreneurs Reach Maximum Potential with Dan Sullivan Co-Founder of ‘The Strategic Coach’Is the Internet Age Killing Effective Communication Skills?